Not only did Jon lose over 100 kilos without dieting and without surgery - amazingly, his body shows almost no sign of ever having been morbidly obese. 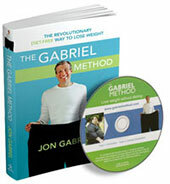 In addition to telling Jon's own story of his amazing transformation, the book reveals why diets don't work and explains a truly unique and revolutionary diet-free way to lose weight. It's based on the fact that your body has an internal logic that determines how fat or thin you will be at any given time. The way to lose weight is not to struggle or to force yourself to lose weight but to understand this internal logic and work with it so that your body wants to be thinner. When your body wants to be thinner, weight loss is inevitable and becomes automatic and effortless. You simply crave less food, you crave healthier foods, your metabolism speeds up and you become very efficient at burning fat, just like a naturally thin person. And that's the real transformation - to transform yourself into a naturally thin person, so that you can eat whatever you want whenever you want and still be thin, fit and vibrantly healthy.